Thank you for your interest in Holy Trinity Episcopal Academy, the premier private school of Brevard County. We encourage you to explore our website to discover more about what makes our school so special. Learn more about our outstanding academic programs, inspiring faculty and all that happens beyond the bell. At Holy Trinity Episcopal Academy, students benefit from the continuity of an academically challenging, college preparatory curriculum that spans preschool through 12th grade. Founded and sustained in the Episcopal tradition, the school’s environment reflects the joy and peace of Christian values, with an emphasis on educating the whole child – mind, body and spirit. Students who "Start Here" build a strong foundation of skills and are prepared to "Go Anywhere" – in college, career and life. At Holy Trinity, students who “Start Here” are prepared to “Go Anywhere” – in college, career and life. By combining a challenging academic curriculum with a supportive and nurturing environment, we instill in students a lifelong love of learning. Holy Trinity students have all the benefits of accelerated learning without the pressures that often accompany it. By balancing academics, the arts, athletics and spiritual growth, students at Holy Trinity are prepared for success at the college of their choice, and they are equipped with the moral compass needed to become leaders of tomorrow. The College Counseling program is designed to assist students and parents in negotiating the unknown, sometimes daunting process of researching and applying to colleges. Helping to create a bridge from the high school experience to college, and eventually a career, the college counseling staff provide opportunities throughout high school to proceed down this road. Emphasis is placed on identifying personal strengths and interests, developing reasonable expectations and submitting applications that are a true reflection of each individual student. When a child attends Holy Trinity, he or she becomes part of a community. A partnership is created between the school and its families. That partnership lasts a lifetime. An excellent education requires funding beyond what tuition provides. Holy Trinity Episcopal Academy relies on annual contributions, endowment income, and other fundraising efforts to meet operating expenses. The investment of gifts to HT ensures that we are able to sustain our mission for years to come. 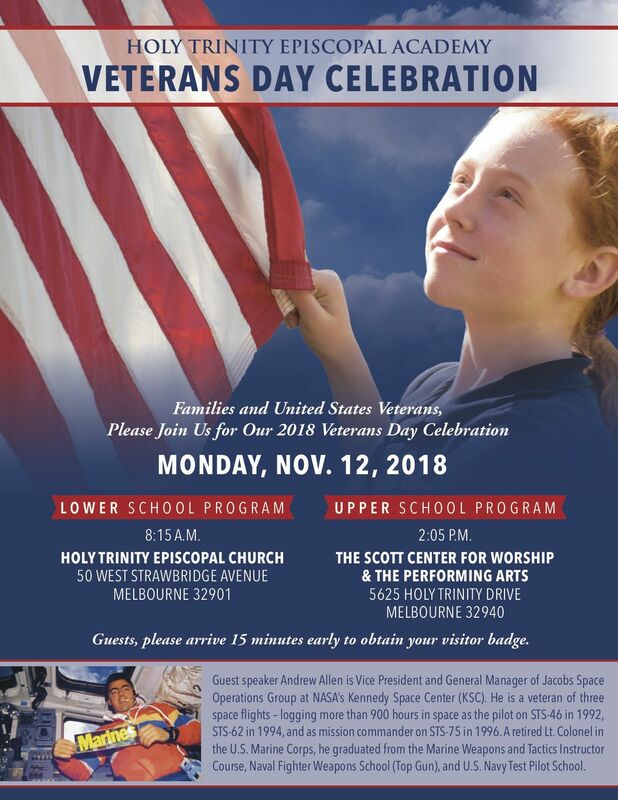 Parents, grandparents, family, friends and United States Veterans, please join us as we honor those who have served our country during our annual Veterans Day celebration on Monday, Nov. 12 at 8:15 a.m. at the Lower School and 2:05 p.m. at the Upper School. Our guest speaker is Andrew Allen, Vice President and General Manager of Jacobs Space Operations Group at NASA’s Kennedy Space Center (KSC). He is a veteran of three space flights – logging more than 900 hours in space as the pilot on STS-46 in 1992, STS-62 in 1994, and as mission commander on STS-75 in 1996. A retired Lt. Colonel in the U.S. Marine Corps, he graduated from the Marine Weapons and Tactics Instructor Course, Naval Fighter Weapons School (Top Gun), and U.S. Navy Test Pilot School. He is also a Holy Trinity parent! Guests, please arrive at least 15 minutes early to obtain your visitor badge. one-time electronic fund transfer from your account or to process the payment as a check transaction.